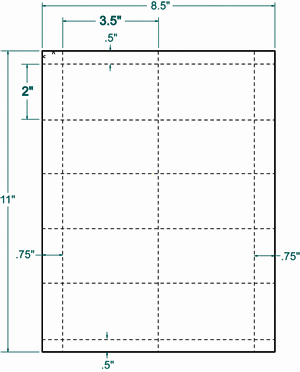 250 Sheets of White 67# Card Stock with 10 Micro Perforated Cards per Sheet. Each Package contains 250 sheets of micro-perforated 8-1/2" x 11" white, 67# Bristol Business Cards. Each Card is 3-1/2" x 2". 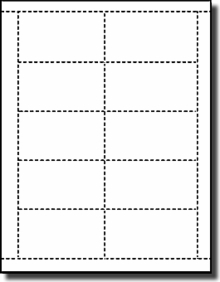 Use Avery® 5371 Template. 50 Sheet and 20 Sheet Packs also available! Us these for virtually all of our fund raising events. Love them. Using them instead of flyers for advertising events Was a great revelation. Much better response. These tickets are perfect for our event "tickets". We can print each session on a different card and they easily tear apart. If you print "tickets" for your event - I recommend these. It's important to note that we do not use these as business cards. We print "production tickets" on these cards and they are used to identify items that we are producing for customer orders. For this purpose, they are fantastic. MUCH less expensive than buy name brand Avery business cards. I think these would also work for true business cards but they are relatively basic, nothing fancy. Of course, great experience and quick delivery from Label Outfitters!